Home > Travel guide > It might sound weird but Vietnamese Egg Coffee is a must-try drink in Hanoi! How do you take your coffee? With a little egg, butter and cheese? In the Vietnamese capital, that’s how it’s served at the famous Giang Cafe. On one of the endlessly busy streets in Hanoi’s Old Quarter, tourists and locals alike can be seen searching for the almost-hidden cafe down a narrow alley where the original Cà Phê Trứng (egg coffee) can be found. 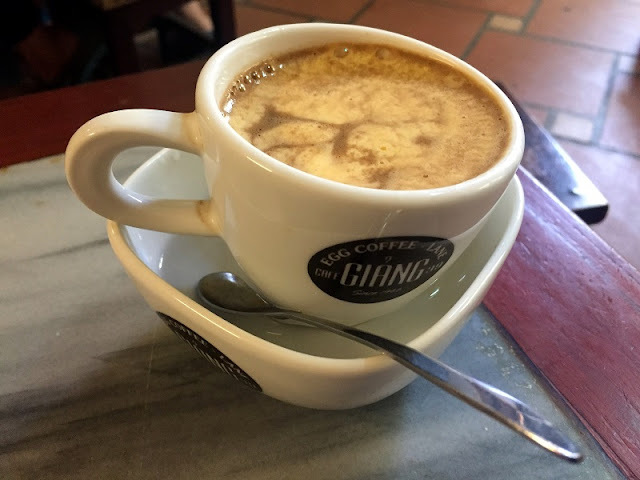 If you want to try the unique egg coffee from Vietnam, Giang Cafe is definitely the place to go in Hanoi. It's not easy to find so watch out for the house numbers; the cafe is number 39 there is a sign with the cafe name but you will not see it in front, you have to walk into a little alley and then go upstairs where the cafe is. I loved the egg coffee, the name may sound weird but it's actually like a soft meringue with coffee. On the menu is an array of drinks but all anyone is ordering is this beverage, in hot or cold versions. The hot one, served with the cup sitting in a small dish of hot water to maintain its temperature, is almost too thick to drink, so I use a small spoon. It doesn’t taste of egg – more like vanilla – and while I can taste the coffee at the bottom of the cup, the egg part is surprisingly light-tasting and not at all sickly, though certainly sweet. The cold option, laden with ice, is more of a dessert and tastes like coffee ice-cream. Yes! it might sound weird but Vietnamese Egg Coffee is a must-try drink in Hanoi! Highly recommended after a tiring walk through noisy streets of Hanoi city tours. Try it once!